The City of Savannah Georgia. The City of Charleston South Carolina. An excellent 1855 first edition example of Colton's rare two part map of Savannah, Georgia and Charleston, South Carolina. Map is divided into two sections. Both maps are rendered on a similar scale thus offering a excellent point of comparison between the two. The left hand map, Savannah, Georgia, covers from the Ogeechee Chanel to Thunderbolt Road and from Laurel Grove Cemetery to the Savannah River. Identifies the Central Railroad Depot, the Magazine Ward, the Gas Works and the City Hospital. A note in the upper left quadrant details Savannah's history regarding its founding and involvement in the American Revolutionary War. A ward reference appears in the lower left quadrant. Savannah is a popular tourist destination being the most beautiful city in the United States and one of the most beautiful in the world. The right hand map, Charleston, South Carolina, covers from Ashley River to the Cooper River and as far north as the Washington Race Course. Identifies all wharves, and piers, the United States Arsenal, the Rail Road Depot, White Point Garden, the Bathing House in White Point Garden, the Citadel, the 'College,' City Hall, the Court, West Point Mills and Chisholm Mills. 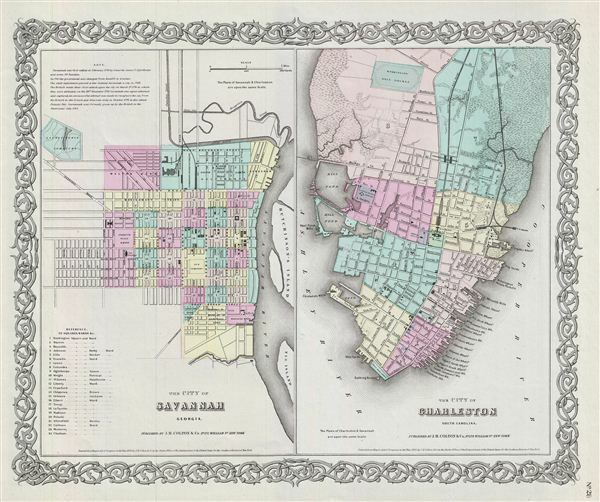 Both maps are hand colored in pink, green, yellow and blue pastels to identify city wards. Drawn to the same scale, they also offer extraordinary detail at level of individual streets and buildings. Surrounded by Colton's typical spiral motif border. Dated and copyrighted to J. H. Colton, 1855. Published from Colton's 172 William Street Office in New York City. Issued as page no. 28 in volume 1 of Colton's 1856 Atlas of the World. Colton, G. W., Colton's Atlas of the World, illustrating Physical and Political Geography, (J. H. Colton and Company: New York) Vol 1, 1856. Very good. Blank on verso. Even overall toning. Rumsey 0149.034 (1856 edition). Phillips (Atlases) 816.